How does the Scandinavian style look? ""et’s go home, because there we find peace and comfort." Light wood, clear forms and friendly colours are what make the Scandinavian style so pleasant. The Scandinavians love natural materials because of their heat radiation. Lots of wood, light and elegant forms - Scandinavian furniture is known for its easiness. "Keep it simple" - the shapes are simple, the design is straight, clear and practical. That is exactly the reason why Scandinavian furniture shape follows function. Additionally, the Scandinavian style presents a furnishing design for everyone and should be available to everyone. The Scandinavians’ love of nature is reflected in the organic forms of the Scandinavian furnishing style. A lot of emphasis is placed on natural products and handicraft. The Scandinavian style is one of the most popular furnishing styles as the Scandinavians have long been pioneers in design and furnishings. 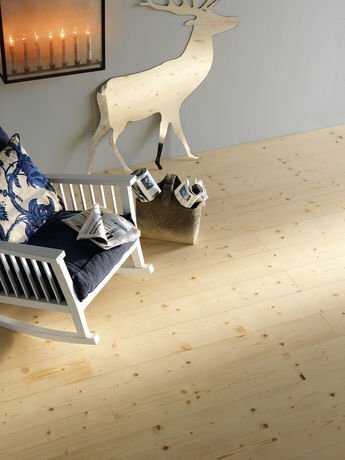 For the floor, usually coniferous woods or light Oak planks are used. This ensures both character and naturalness are delivered by the floor. Larch and Douglas Fir are especially ideal for use in combination with the colours of this furnishing concept. The advantage of these woods is also their robustness, although coniferous woods tend to be a softer wood. However, for those who have high demands, such as on floors in gastronomy and the hotel industry, there we recommend Oak in white or extremely white oiled surface finishes.